Arnold Partners has made CFO placements in several different industries and in many major, successful companies. We’ve worked with the CEOs and executive boards of these businesses to bring in CFOs that have helped them continue to grow. For more information on how exactly that happened and what our placements have done for them, visit our Success Stories page. 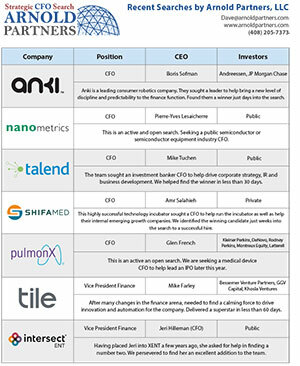 In order to find the best CFO possible for your company, we’ve created and fostered relationships with some of the strongest Venture Capital firms in the country. It is from this pool that we can find multiple candidates that could be right for you, giving you both quality and quantity of options. Of course, we are always on the hunt for new and upcoming candidates so that your business always has access to the best and brightest options.